When it comes to cheese I can be a bit of a snob purist and don’t tend to like it mucked about with but I have to admit a penchant for a good smoked cheese. So when Iona Hill from Ribblesdale Cheese, as well as sending me some of her Goat Gouda, also included some Ribblesdale Smoked Goat I was in sniffing and tasting heaven. I’d tried the cheese before, when I came across it on an East Anglian market stall and wrote about it here. This time I decided to cook something with it and a suitably seasonal butternut squash sitting on the sideboard gave me the idea for this recipe. 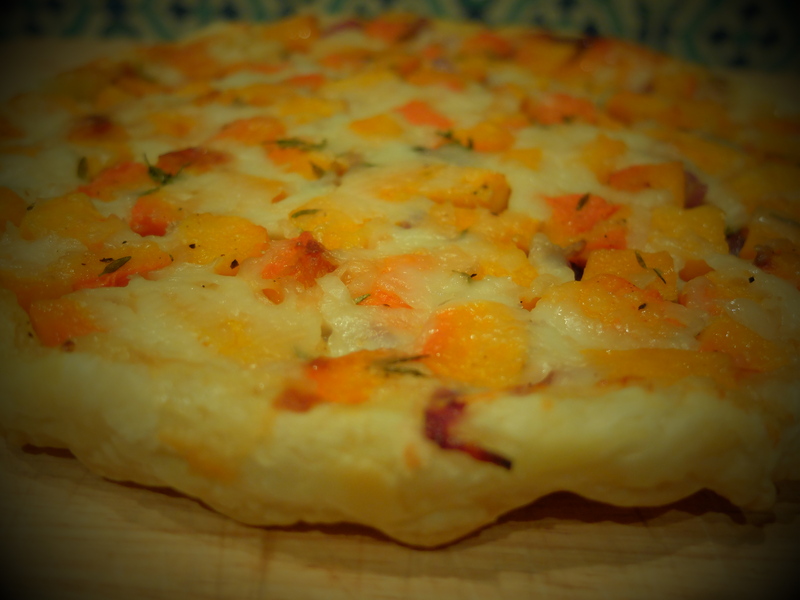 It’s cold-weather comfort food, with its buttery pastry, smoky cheese and hearty squash chunks. Obviously, the French would be as likely to accept that this is a tarte tatin as they would permit me to dance in the Folies Bergère, but I’m sticking by it anyway on the basis that it’s upside-downy and contains pastry. Preheat the oven to 200˚c / 180˚C fan assisted / Gas Mark 6. Peel and de-seed the squash and cut it into small chunks (half-inch-ish). Toss them in the olive oil, drizzle with the honey, season with salt and pepper and roast for 20-25 minutes until soft. Meanwhile, fry the red onion slices in a little olive oil until they are soft and starting to brown at the edges. Grease a round roasting tin or shallow cake tin and then line it with greaseproof paper. 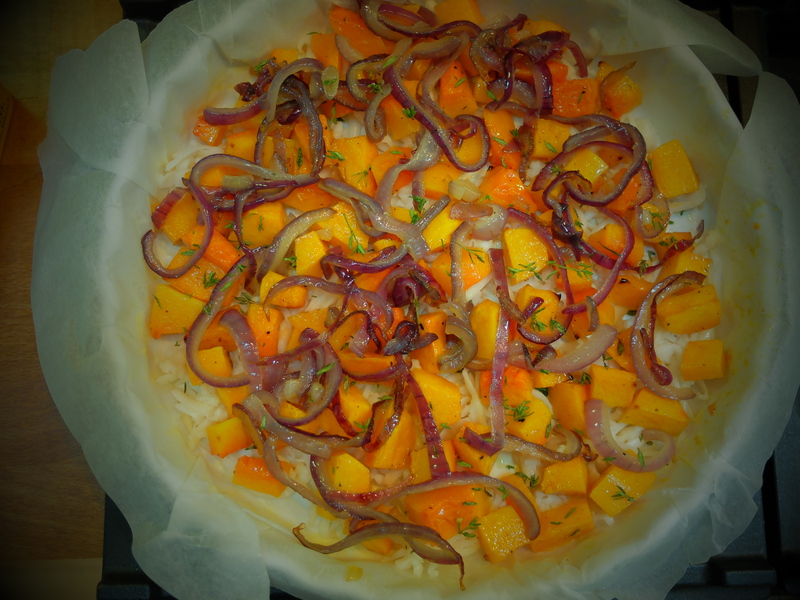 Cover the bottom with the goat’s cheese, then arrange the squash chunks evenly over the top, followed by the onion and thyme. 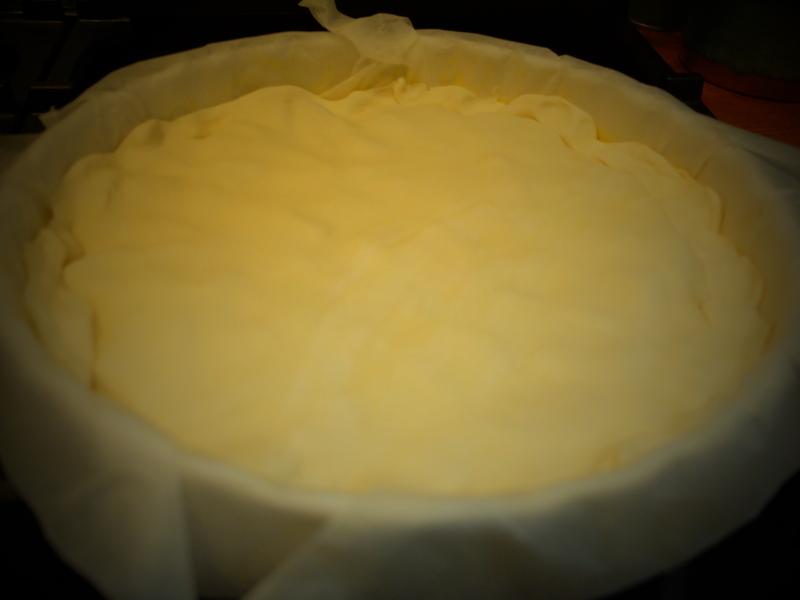 Roll out the puff pastry into a rough circle and press it on top of the mixture in the tin, trimming the sides of the pastry and poking it down into the sides of the tin. Roll out any remaining pastry and press that down on top. Bake it in the oven for 20-25 minutes until the pastry is golden. Remove it from the oven and carefully flip it over on top of a chopping board or similar flat surface. Peel back the greaseproof paper and you should be able to move it with a fish slice onto a plate. Serve warm or cold, with slippers and a slanket. I’m sure I read a definition of tarte tatin somewhere that ran along the lines of ‘upside downy and containing pastry’! But tarte tatin or not, it looks delicious. Exactly, I knew I was right 😉 Thanks! That does look good. I do love having a real fire and am now imaging myself sitting at home in front of the fire eating a smoked cheese tart with a glass of wine! Sounds yum – will try – (and modern wood-burners are ok….honest!) What’s a slanket? Oh…..a bit like my foot splanklet. A springer called Rudeboy! You won’t need your slanket when you have your wood burner….but thank you for enlightening me. There’s a whole world out there……..
Tarte Tatin or not, I call it delicious! All good, as long as you don’t chow down on the slanket and tuck the tart around your knees by mistake. Perfection. Everything thing you post. OMG! heaven on a plate! A perfect mix of gorgeous ingredients!!! Oh wow! My attempt was recognisable but a bit grim. Did you use a kit? Are you blogging about it? I got a couple of kits recently by the Big Cheese Making Company I think it is. One for mozzarella/ricotta and one for goats cheese. I may blog about it once I’ve had another few goes!! Smoked Goat Cheese?!? WOW! Never heard of smoked goat cheese. YUMMMMM! That is butternut squash? Going to save this recipe! I’m thinking Gouda, but if I can find smoked goat cheese I will definitely use it. 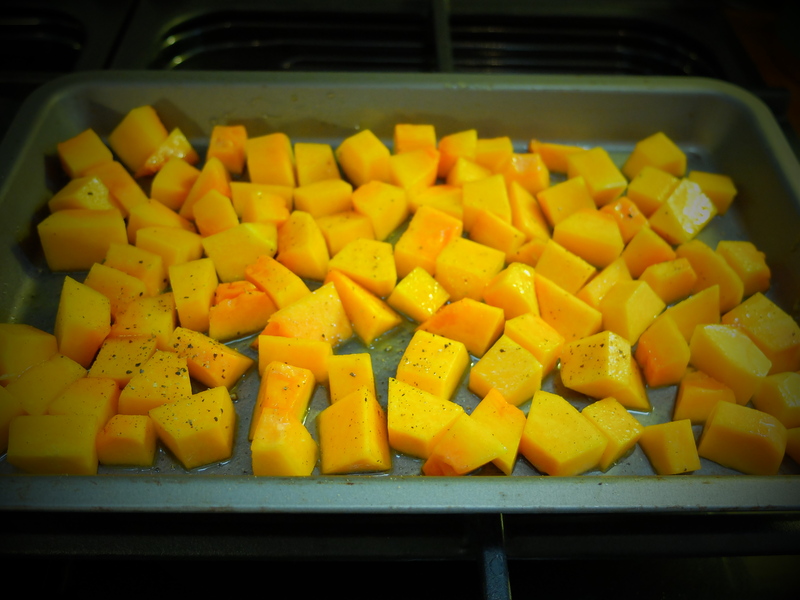 I am a new fan of butternut squash, that is why I asked. Thanks for sharing! This looks delicious! I think I’m gonna try it this weekend – maybe not with smoked cheese as not sure will be able to find but I’m sure just normal goats cheese will be fine?